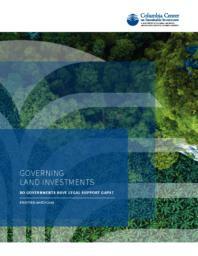 Briefing: Governing Land Investments: Do Governments Have Legal Support Gaps? The terms governing land investments can shape whether host countries and local communities benefit from investment projects. Yet host governments in low- and middle-income countries often lack sufficient legal and technical capacity to prepare for, negotiate, implement, and monitor investments, and can confront barriers in accessing necessary expertise. This report focuses on the “legal support gaps” encountered by low- and middle-income countries in the context of investments for agricultural and forestry projects that are regulated by investor-state contracts. It offers good practices—for host governments, donors, legal support providers, and investors—that can increase government access to, and use of, legal support and improve the capacity of lawyers to help governments achieve responsible land investments.